﻿If you think back on some of your favorite books as a child, or the books you read to your own family members and loved ones, there’s likely some stories or motifs that stick out in your memory. Examples of popular themes in children’s books include not getting to bed on time and all of the chaos it can create, what eating too much food can cause, or why being nice to siblings can bring positive experiences. These subtle themes introduce new ideas to children as well as humanize lessons for them. Some books take these lessons even further by relating them to some of the “Golden Rules” or basic social skills that children should learn when they are young. Aesop’s Fables is perhaps one of the most famous for popularizing these ideas for children, but it’s a common practice among popular contemporary children’s literature. Take a look at some of the examples below that you may have not realized subtly suggest a larger life lesson to children. “The Rainbow Fish” by Marcus Pfister follows the story of a beautiful rainbow fish who keeps his beautiful scales to himself instead of sharing them with the other fish, leaving him with no friends. By the end of the book, the fish learns that giving the other fish some of his scales made him friends, thus embodying the “sharing is caring” motto we often teach children. “Corduroy” by Don Freeman depicts the story of a teddy bear who goes on a hunt for his missing button that he believes he needs for any child to love him enough to buy him. After an adventure-filled and fruitless excursion for another button, a little girl buys him and loves him for his flaws. This book touches on the lesson that no one is perfect and everyone has flaws; it’s just about learning to love yourself as you are. No children’s book list would be complete without a book from Dr. Seuss. “The Lorax”, perhaps one of his more popular and pertinent books, is a cautionary tale about treating the Earth with respect. It follows a child and his discovery to how his previously breathtaking town came to become such a desolate and destructed area. This book not only teaches children about the importance of sustainability and moderation, there’s also an overarching theme about the importance of learning from the past. Words Alive knows that there are countless more benefits to reading aloud to children. In addition to introducing life lessons to them, reading aloud can also support their overall knowledge of books in general, cadence of reading a book, and vocabulary. If you would like to support our journey in ensuring more children are able to participate in the experience of reading aloud, you can visit our Read Aloud Program homepage here to learn more. An image from our Champions for Youth Read Aloud event. A group of students stare intently at a book that is being help open by a member of the PGA Wives Association. Scholastic recently published their bi-annual report on reading aloud. The report focused on the prevalence of reading aloud in the home, at what age this is most common, and the implications of the study. When the study was first conducted in 2014, the percentage of babies younger than 3 months old who were read aloud to was 30%. Four years later, this has increased to 43%. Additionally, the percentage of children younger than one year who are read to has increased from 73% to 77% in 2018. It’s noted that this study began the year that the American Academy of Pediatrics began encouraging parents to read to their children beginning at birth. Despite the possible reasons behind why there has been a rise in the number of children who are read aloud to, it is a positive trend that helps to prepare babies and young children with language skills that will be important in their lives. When asking the parents and children about how much they enjoy the reading aloud experience, the trend is also positive, with over 80% of children and parents rating read aloud time as something they “love” or “like a lot”. Several different benefits of the read aloud experience were referenced by the survey participants, from activities such as picking out the books to the talking and laughing that the whole family gets involved in. Asking questions and making sound effects are also part of the read aloud experience that is measured in the study, as these are positive actions for both the reader and audience to participate in. The study shows that the practice of reading aloud peaks at the age of five, lessening around the time that the child enters kindergarten and can read on their own. However, at this age there is still much to learn in terms of vocabulary, writing styles, and plot. The article points out that continuing to frequently read aloud beyond this point is a key factor in predicting whether or not children ages 6-11 will be frequent readers (which we knows leads to better educational and social outcomes). Lower-income families with children ages eight and under read aloud less frequently; 39% of families with household incomes less than $35,000 read aloud to their children 5-7 times a week compared to 62% among families with incomes of $100,000 or more. Lower-income families with kids ages five and under are also less likely to have received information on the importance of reading aloud from birth. At Words Alive, we understand the importance of reading aloud, and in fact have a whole program dedicated to helping children become lifelong readers by participating in engaging read aloud session with our volunteers. Also, our Family Literacy Program focuses on educating participants about why reading is an important family activity. If you would like to learn more about our programs, click here. What happened in our Read Aloud Program in the 2017-2018 school year? After their Read Aloud session, students read their favorite books in their 2nd grade classroom. Due to the two previous years’ successes implementing the Read Aloud Program in United Way City Heights Partnership for Children’s Readers in the Heights Program, we were requested this year to become their literacy experts. By training staff members and providing further resources, we created a Read Aloud Program model of delivery that could be used to serve kindergarten to 3rd grade children across seven sites. This partnership, starting in 2016 and initially reaching 40 children in the City Heights neighborhood, is helping to combat the summer slide, developing curiosity, wonder, and a love of reading for over 320 children. Our work with BASE (Before and After School Education) in Oceanside has been an exciting new venture that has given us the opportunity to expand our program offering, creating 4th and 5th grade curriculum and furthering our impact outside of the school day. Through our partnership with BASE we served approximately 120 K–5th grade children and were able to evaluate the Read Aloud Program with children who have never experienced Words Alive before. Read Aloud facilitator Sharon has been reading in Golden Hill Elementary School classrooms since 2015. Throughout her tenure, she has watched the development of many students, from kindergarten on to 2nd and 3rd grade. Students she had read to in the past are now reading books to their own classrooms, families, and to Sharon herself, which truly exemplifies the Read Aloud spirit. The graph above shows that nine out of ten teachers reported that the Read Aloud Program had an impact on expanding students’ knowledge of literacy terms, vocabulary, and concepts of print. Eight out of ten teachers reported the program had an impact on improving fluency and learning phonics. Congressman Scott Peters reads to a K–2 classroom as part of our annual Share Your Love of Reading Campaign. While we continue to work with teachers in 103 classrooms across San Diego and Escondido School Districts, we have been excited by the impact of the Read Aloud Program outside of the school day. Summer and after-school programs have proven to be great partners in furthering opportunities for children to be exposed to an exciting world of literature, inspiring curiosity, and widening aspirations. We look forward to building on this model in 2018–19, enabling others to facilitate the Read Aloud Program and reach beyond our volunteer foundations in San Diego. Learn a New Word Today! An image of one of our Adolescent Book Group students working on a blackout poetry exercise, which requires them to select certain words and phrases from a page of text to construct a poem. October 16th is National Dictionary Day, which celebrates the English language on the day that Noah Webster was born. Webster is known for his publication An American Dictionary of the English Language, which included 70,000 words and involved learning 27 languages in order to determine the etymology of the words. This publication from Noah Webster is a predecessor to the now widely recognized Merriam-Webster dictionary that has helped millions of people understand new words. Learning new vocabulary is an integral part of a child’s development and continues to be important into our adult lives. In an article on TalkingKids.org, it’s estimated that 3 year old children typically have between 500-1,100 words in their vocabulary. These are words that they can both verbalize and understand. A few years later, between the ages of 5-7, children typically have the knowledge to use between 3,000 to 5,000 words in their conversations. At this point in their life, their brains are “sponges”, absorbing their surrounding environment at a rapid rate. An article on Scholastic.com outlines three reasons why vocabulary is such a large focus for children. First and foremost, vocabulary itself makes up communication -- how we speak, read, listen, and write. Secondly, the goal of reading is to understand and grow from the material. Understanding and overall comprehension of the text improves when we know the vocabulary included in it. Lastly, when children and adolescents improve their vocabulary, their academic and social confidence and competence improves as well, allowing them to succeed in diverse environments. Reading is one of the best ways to gain exposure to words that may not be in used often everyday conversation but have significant meaning and can be added to your “word bank” for future use. On the U.S Department of Education website, a presentation about vocabulary development outlines the correlation between time spent reading and the number of words we are exposed to each year. With less than one minute of reading each day, we are exposed to 8,000 words per year. With 4.6 minutes of reading each day, we are exposed to 282,000 words per year. And with 20 minutes of reading each day (the recommended amount for beginning readers), we are exposed to 1,800,000 words per year! Learning and comprehending new words by using context clues or looking them up in the dictionary is an important step in becoming a more advanced reader. An image of four dice spelling out the word “risk.” The word “hazard” originated from an Arabic word for a dice game that involved high risk! National Dictionary Day also celebrates the etymology of words: where they originated from and how they came to be a part of the English language. Oxford Royale Academy lists some common words with some very interesting backgrounds. Take “hazard” for example: a word dating back to 13th-century Arabic of which “al-zahr” referred to dice used in gambling games, which had a high amount of risk involved for participants. “Al-zahr” subsequently became associated with danger and was believed to be brought to Britain when the Crusaders learned these dice games while in the Holy Land. Looking for a fun way to celebrate this day? Try looking up etymologies of new words you learn -- or everyday ones such as sandwich or genuine! To celebrate dictionary day year round, there are multiple “word-a-day” apps and emails you can receive, including Merriam-Webster and Oxford English. Words Alive Curriculum Sneak Peek! Words Alive’s Adolescent Book Group and Read Aloud Program have started back up for the school year! We are excited for our volunteers to get back into the classroom and engage with students while reading and talking about books together. In our curriculum for both programs, we focus on new, diverse, and relevant texts so that students can see themselves represented in popular stories. In 1965, The Saturday Review published “The All-White World of Children’s Books” showing that only 6.7% of children’s books published in the past three years had included black characters. By 2013, the numbers had only risen slightly to 10%. More than a third of people in the United States are non-white and they deserve to see themselves represented in literature as much as anyone else. Providing students with diverse representation in books is so important in our programs and allows students to make connections between the books they read and their own lives. Here is a sneak peek of a few of the books we’ll be reading in each program this year! Although children’s books are generally shorter, we want to ensure that students get the most value out of each book we bring into the classroom. Rather than reading through each book and moving quickly on to the next, our volunteers bring the book to life by asking questions before, during, and after reading aloud to encourage the students to participate. The goal is to bring enjoyment to the classroom through reading while helping children develop cognitive, language, and social-emotional skills. For the month of October, we have a Halloween themed book titled Trick-or-Treat: A Happy Hunter’s Halloween. The book includes 15 different poems describing youngster’s Halloween celebrations, accompanied by bright illustrations. While reading, our volunteers help students focus on rhyming, rhythm, and emotion. Students are also given the chance to learn about and create their own silly alliterations and share their own Halloween costumes with their peers. Another book our volunteers are looking forward to reading is Giraffes Can’t Dance. This book follows Gerald the Giraffe’s journey from a self-conscious to graceful dancer, including all of the animals and friends he meets along the way. As with most books at this level, our volunteers talk a lot about the book before reading it -- what do the students think the story will be about? Where do they think the book is set? After reading the book, some topics of discussion will be idioms included in the story as well as what lessons were learned. Who Says Women Can’t be Doctors? describes Elizabeth Blackwell’s decision in the 1830s to become a doctor instead of a mother or housewife. A big focus of this book is relating it to the students own lives: what do the students want to be when they grow up? Does it remind them of any other people they know who have worked to achieve equal rights? Relating a book to our reality helps bring the book to life and can make it a more memorable activity for students. Our ABG program serves teenagers in alternative schools who have faced extraordinary circumstances such as violence, pregnancy, and homelessness. Our trained Words Alive volunteers facilitate book discussions, writing workshops, and projects to help bring the books alive. Among the new and diverse texts we’re bring into the classroom this year is Turtles All the Way Down by John Green. Positive and accurate mental health representation is still so rare in our media and this book can be highly impactful for students with any type of mental health problems. This book explores topics of friendship, mental health, and mystery as 16-year-old Aza investigates the disappearance of a billionaire The discussions around this book include some of the unique writing techniques John Green employs, as well as how mental health plays a part in the story and in real life. We’re also excited to introduce students to the wonderful YA coming-of-age novel, Aristotle and Dante Discover the Secrets of the Universe by Benjamin Alire Saenz. This book follows two high school aged boys, Aristotle and Dante, as they struggle and come to terms with their racial and sexual identities and feelings of loneliness and anger. This book tackles a wide range of topics for students and volunteers to discuss together, and while reading students will be able to enjoy Saenz’s poetic and beautiful writing style. Finally, a brand-new book we’ll be diving into this year is Anger is a Gift by Mark Oshiro. This book details Moss Jefferies’ life after his father was murdered by an Oakland police officer and how he continues to be treated like a criminal in his own school. This book touches on themes of racism, oppression, police brutality, and activism. Discussions around this book focus on problem solving, activism, and how different upbringings can affect perspective. This sneak peek represents just a few of the books we’ll be reading and discussing with students this year. These engaging, diverse texts and topics are sure to get all of our students excited about reading and learning! This quote by Edward Miller sourced by The Storyteller Agency encompasses how important storytelling has been and continues to be in every person’s life. Stories are what we grew up hearing, teaching us between right and wrong. We came running home from school, eager to tell our parents stories about our day. As we grow up, it’s a way to express ourselves through courses and college entrance exams, how we sell ourselves to potential employers. As an adult, the art of storytelling is a necessary skill in many careers to sell products to future customers or to let others learn from our mistakes. The stories we were told as children that stuck with us our entire lives will continue to be passed down for generations, serving the same benefit as it did for us. As we think about how prevalent stories are in our lives, let’s walk through the history of storytelling, from ancient history to present day. An image from the Chauvet Cave, depicting multiple rhinos. In a Princeton Publication titled “The Irresistible Fairy Tale: The Cultural and Social History of a Genre” by Jack Zipes, he stated that humans have been telling stories since we had the ability to speak, and potentially by forms of sign language even before that. Though these stories tended to mark an occasion, set an example, or warn about danger, they also sought to explain the inexplicable through forms of fairy tales or tall tales. Though to date, we do not have any recordings of these original stories, we have discovered proof of visual representations of stories from our late ancestors. The Chauvet cave in France is the oldest representation of storytelling found thus far, dating to 36,000 years ago. The cave paintings are believed to tell the story of a volcanic eruption, according to an article published on News.Artnet.com. Later forms of visual storytelling can be found in Egyptian hieroglyphics from around 3,000 B.C., which mixed pictographic symbols and sounds in order to tell a story. In “The Evolution of Storytelling” on reporter.rit.edu, it is mentioned that these stories were for religious documentation and to give messages to future generations and inhabitants. Around 700 B.C., there is evidence of the first recorded stories that include the Epic of Gilgamesh and the Iliad by Homer. The fact that these stories were recorded enabled them to spread quickly and widely across the world. Around this same period, there are other surviving stories that are still widely known today, which can be attributed to the fact that they were able to be recorded and written down, including those now known as Aesop’s Fables. Without the written language to record these stories that originated as person-to-person tales, they may not have lasted for over 2,000 years. Today, we tell stories through multiple methods of illustrations, written word, and oral storytelling. What began in the early stages as cautionary tales or part of ceremonial practices, has evolved into a method of exploring emotion, developing vocabulary, and strengthening overall cognition. Storytelling is important in all cultures to not only hear, but also to tell. At Words Alive, we understand the importance of this and encourage our participants to relate their experiences to the books we read aloud and to join in telling their story to let their voices be heard. If you are interested in helping us build literacy skills for youth in San Diego, visit our website here to learn more details about sponsorship opportunities for our upcoming Author’s Luncheon! Is Literacy a Constitutional Right? A Words Alive graphic that says, "Literacy is the foundation of community and economic development. When everyone can read, whole communities thrive. We read to live full, independent lives. We read to...." The following list includes statements such as "apply for jobs that pay a living wage", "advocate for our families", and "vote or write to our elected officials." A lawsuit filed in 2016 to establish literacy as a U.S. Constitutional right was struck down by a federal judge last month. The suit argued that Detroit students are excluded from the state’s education system, thus violating their rights under the due process and equal protection clauses of the 14th Amendment of the Constitution. These clauses say that no state can deny any person life, liberty, or property without due process of the law and also prevents states from denying equal protection of the laws to any person. An article from the Detroit News details the fact that though the Constitution does not explicitly guarantee the right to education, the Supreme Court has not confirmed nor denied it either. The judge also wrote that the case needed further supports to prove their case, which leaves room for this case to come back and be tried later to help support students from Detroit and across the nation. In 2017, the US Department of Education found that 65% of fourth-grade children nationwide were not proficient in reading. When so many children have fallen behind before they are halfway through their schooling, it is difficult for them to successfully continue and complete their education. When looking at the high school completion rates, the National Center for Education Statistics states that for the 2015-2016 school year, 1 out of 6 students failed to graduate with a high school diploma within 4 years of starting 9th grade. Without a high school diploma, finding a job that pays a living wage is increasingly difficult. According to the Bureau of Labor Statistics for 2017 data, a full-time worker without a high school diploma earns a median weekly wage of $515, while a worker with a high school diploma earns $718. When these individuals are successful in high school and have the skill set to pursue higher education, they earn a median salary over double that of someone who didn’t complete high school: $1,189 weekly wages for those with a bachelor’s degree. This demonstrates how the literacy skills that are taught in early years of school can lay the entire foundation for the future of a child’s life. Currently, about 20% of adults in the United States are not earning a salary considered to be “a living wage.” Furthermore, applying for jobs and filling out employment forms also require reading and writing skills, making it difficult for these individuals to improve their situation. A picture of a child in our Read Aloud Program holding the book "Are You My Mother?" while smiling. By failing to provide the proper education for these children, the government may experience higher costs in healthcare as well. Literate adults have the knowledge and skills to seek out more preventative forms of healthcare including contraception use. According to debt.org, it is estimated that $18 billion could be saved annually if patients who have non-urgent/avoidable medical concerns were to take advantage of preventative health care instead of relying on emergency rooms for their medical needs. Emergency rooms are required by federal law to provide care for all patients, despite if they have insurance or are unable to pay, meaning that it is a popular choice for those who are disadvantaged. There are countless more studies that show that illiteracy is connected to other undesirable life outcomes, including incarceration and reliance on public assistance programs. To illustrate, 3 out of 5 people in American prisons can’t read, and once they do leave the prison system, there aren’t any programs that allow them the opportunity to learn how to read in order to properly apply for a job. According to an article on The Observer, arming inmates with a solid education is one of the surest ways of reducing the rate at which they end up back behind bars after being released. The prison system is beginning to make moves to address these issues, but the real change needs to happen before these individuals are incarcerated by providing them with the education and tools to develop a healthy, independent lifestyle. At Words Alive, we’ve created a “Why Literacy Matters” graphic (included above), illustrating how literacy is present in daily life and how necessary literacy is for living a full and independent life. Declaring literacy as a constitutional right would make these day to day tasks possible for everyone, allowing them to create a life for themselves that they are able to choose. Providing high-quality literacy education and opportunities at the beginning of these children’s lives is the start to building a generation that is able to accomplish their goals and achieve heights their parents were not able to. Because literacy tends to be “passed down”, meaning that it is difficult for an illiterate guardian to help a child read or do homework, it is important that the children today have the proper education and the right to break this cycle of illiteracy. If you are interested in helping the literacy cause closer to home in San Diego, visit our volunteering page here. A picture of Read Aloud volunteer, Barb Takahashi, talking with Golden Hill students in her small group session. Words Alive runs multiple literacy programs that focus on teaching strong literacy skills and a commitment to reading to children, teens, and families. One of our most popular programs is the Read Aloud Program, which currently serves over 4,300 Southern California students that are between Preschool and 3rd grade. We offer this program in a “small group format” to a few of our school sites, in which our trained volunteers visit the classroom for 90 minutes each week to read to the group as a whole, then split the class into groups of 3-5 students to discuss the book and do small group activities. A study from aecf.org showed that students who are unable to read proficiently by the time they leave 3rd grade are four times more likely to not receive a high school diploma. Because of their young age and the relationship between literacy and success in education, we want to provide the most benefit we can in the 90 minutes a week that our volunteers visit the classrooms by fully engaging the students. We vet and train our volunteers to ensure they understand the discussion material and have the appropriate props, stories, and photos to help bring the books to life for the students. These volunteers are able to bring more materials to the classroom so the group discussions are able to make the connection between the book and their everyday lives. Another benefit of the program, as noticed by our volunteers, is that all children are given the opportunity to participate. In a group of 30 or more students, children don’t always have the support to get individualized attention and encouragement to speak up like they do in smaller groups. They are also given the opportunity to use the new vocabulary and read aloud, so they can have another method of internalizing the new information. 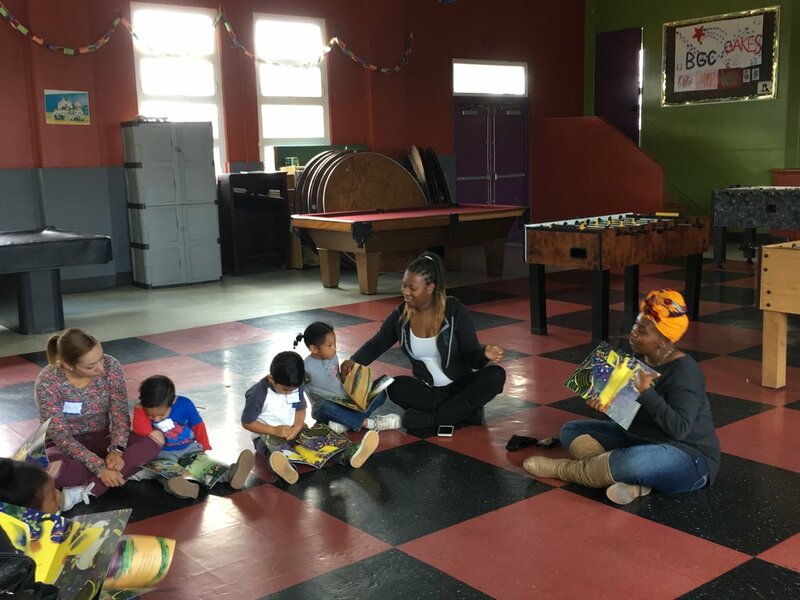 In order to measure the effectiveness of the program, Words Alive partnered with the University of San Diego’s Caster Family Center for Nonprofit and Philanthropic Research and surveyed the teachers and volunteers involved in this small group format of the Read Aloud Program. When asking them about the effectiveness of the small groups, 9 out of 10 teachers agreed that it encouraged more individual participation, helped students understand the story, and resulted in deeper discussions. Teachers also positively rated their student's reading motivation as a 4.1 on a 5 point scale after they participated in our Read Aloud Program formatted with small groups. Reading motivation is a key literacy indicator because it shows the self-confidence and desire to continue reading, which leads to more learning and practice. In these underserved schools particularly, there is often times no guarantee that students are provided with the necessary resources and support staff to receive the individualized attention that our Read Aloud Program provides. That is why teachers and volunteers believe in the work that we do and recommend the program to other schools. If you would like to become a volunteer in our Read Aloud Program, or any other positions at Words Alive, visit our website here to learn more.